For the uninitiated, Les Misérables is set during the 18-year period following the French Revolution. There is good and evil, but not a whole lot in between. People fall in love at first sight and die by simply losing the will to live. All the Big Themes pop up – crime and punishment, mercy, redemption, faith, and hope. Poverty is the chief aesthetic feature. Coffins are a motif. And even at two hours and 47 minutes, the plot rolls by at a breakneck speed. Suffice to say, this is epic, mythical stuff. From the very first scene, director Tom Hooper’s agenda is obvious – make one of the most beloved musicals of the last three decades into a bona fide twenty-first century film. In what appears to be an attempt to add gritiness to the proceedings, handheld camerawork abounds. Aside from a few big CGI-enhanced zoom outs, the shots tend to be very abrupt. The singing was reportedly performed live on camera with no studio overdubs. But in terms of set design, Hooper pulls back on the reins and doesn’t go cinematic enough. (For example, the the props for the revolutionary sequence look to be borrowed right from a London stage production.) The end result is a really mixed bag, visually speaking. Will fans of the musical love it or hate it? Who knows. 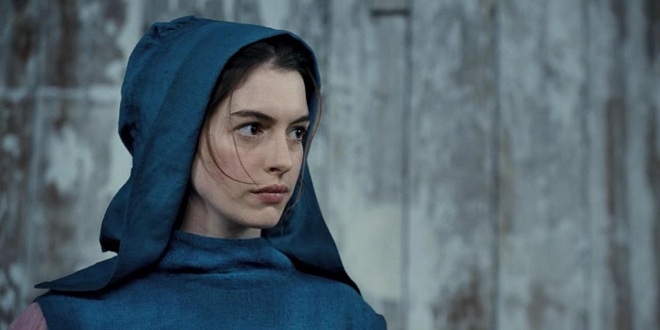 But one thing is clear: Anne Hathaway owns this film. Witnessing Hathaway’s rendition of Fantine’s “I Dreamed a Dream,” I could not help but think that while it’s one thing to perform at a considerable distance from the closest set of spectator eyes, it’s a whole different feat to give such a compelling performance as a close-up that will be projected 60 feet high. Hathaway is clearly acting for the screen, which is exactly what the film needs, even if it may not be what the fans of the musical will want. And yet, the strongest single element also serves as a bit of a weakness, as this emotional crescendo of the film hits about a quarter of the way through. Fortunately (or unfortunately), Hathaway doesn’t have enough screen time to eclipse the rest of the ensemble. Hugh Jackman, who does the heaviest lifting as Jean Valjean, ranges from serviceable to outstanding, depending on the strength of the songs. (Virtually all the dialogue is sung, and Jackman seems to get some of the worst of the functional interludes.) Amanda Seyfried lights up the screen – sounding like a songbird – as the (almost) grown-up symbol of innocence and hope, Cosette. Newcomer Samantha Sparks brings her stage experience to bear and demonstrates why she beat out Taylor Swift for the role of Éponine, the most interesting character in the second act. And Sacha Baron Cohen and Helena Bonham Carter team up as Monsieur and Madame Thénardier to add a much-needed sense of sinister fun. The only serious misstep – to the point of distraction – is the casting of Russell Crowe. To put it simply, Crowe lacks the vocal strength to stand his ground, and as the source of oppression and danger driving the story, Javert is a character who desperately needs a strong voice. For fans of the original musical, this movie is a must-see. For fans of the Oscars, this movie is a must-see. But for the cinephiles, this movie may leave you wanting a little more cinema and a little less stage production. Thanks for your comment and I hope you enjoy it. I should add that at the advance screening I attended, the film did get a healthy amount of applause at the end. Good! I love a movie that moves an audience that way. I’ll be bringing tissue as well, since the trailers alone are doing me in. I know. I’m going to be an easy audience when it comes to this particular film.